Could anyone guess what language is used in the sign made on this dagger hilt, supposedly of Persian provenance, and dated approx. 1700-1750? A fellow translator asked if I knew, and naturally I don't know. 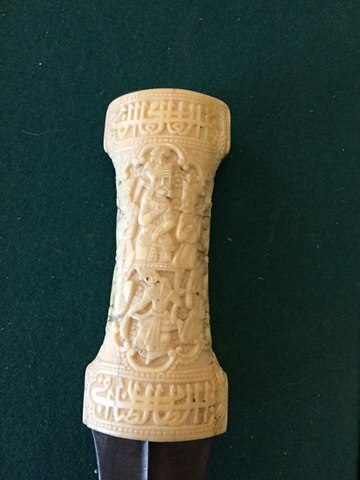 This is stylistically typical of Qajar period, Persian walrus ivory jambiya hilts. As user @Spencer noted, human figures are rarely depicted in Islamic art other than in paintings. However Qajar artworks were the exception that proved the rule, and exhibited significant European influence. 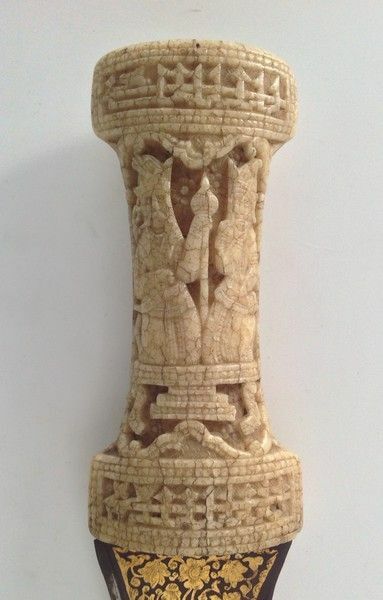 Likewise, such hilts were commonly decorated with Gothic-esque reliefs, and inscribed in either Persian or less comonly Arabic, in the nastaʿlīq or taʿlīq scripts. The inscriptions are often some relevant, cool sounding phrase. The Metropolitan Museum of Art holds one item where the nastaʿlīq inscription reads, "the handle of your dagger is world-seizing." Harvard Art Museums has one example commissioned by Aga Khan, with a ta'liq inscription that described its relief as the: "likeness of the incomparable Muhammad Shah, a heaven of grandeur, a vessel of beauty". 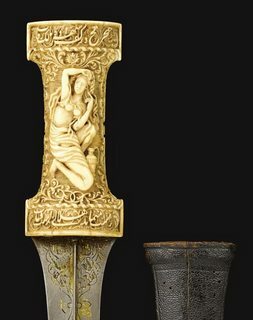 (1) Qajar dagger with ivory hilt "carved with panels of Qajar princes, with attendants, between stylised Islamic script" - Philip Carrol Antiques (2) ivory hilt inscribed with "the bending dagger in the hand of the Prince who dominates, is like a crescent (moon) in the hand of the sun". 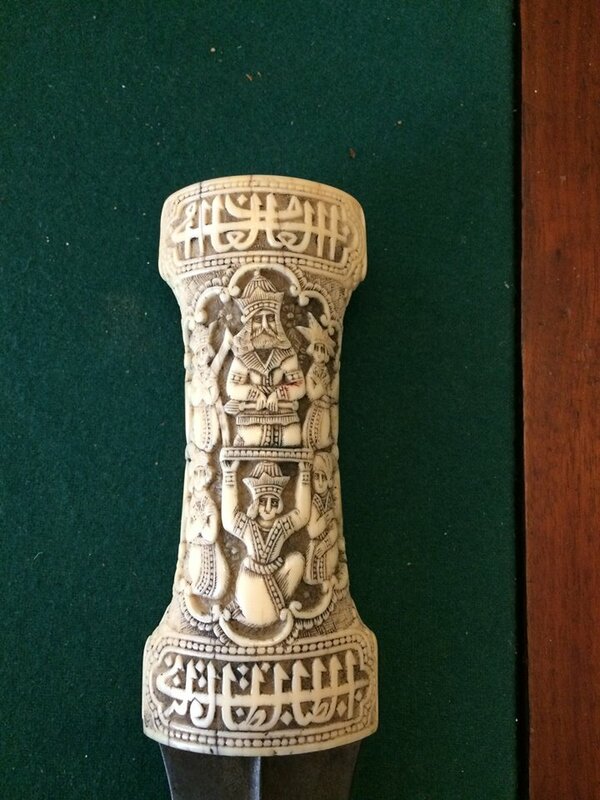 Other common inscriptions include Koran verses, prayers, or signatures by the artisans. However, it also appears that sometimes the "inscriptions" are actually just stylised scripts meant as decorations. Given that users @tohuwawohu and @moudiz said the inscriptions in the OP's images are not intelligible Arabic, this may well be the case here. Not the answer you're looking for? Browse other questions tagged weapons middle-east islam identification art or ask your own question. Can someone tell me more about this dagger with a bronze hilt?